For anybody who is resident in Rochester Hills, MI and who is looking to rent a party bus can stop searching now. Here at Rockstarz Limousine and Party Bus, we specialize in this form of entertainment and we can guarantee that you are going to be more than happy with the time that you spend in our company. Searching for a party bus in Rochester Hills used to be pointless, but that was until we came along. Since then, we have changed the game thanks to our specially designed party bus that allows you to invite even more people along than ever before resulting in your party being even bigger and better than you were possibly expecting. 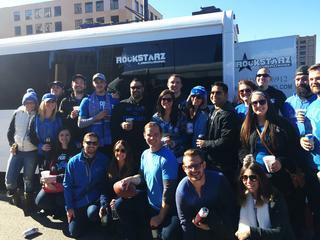 Of course, there is more to our Rochester Hills party bus rental service aside from the space because we know what is required to get a party started, and we know how to provide it. From the booming sound system, that will just take your music to another level, to the laser light show that is used just to give some extra atmosphere, you are going to feel that you have a private nightclub that is there just for your pleasure. In the past, individuals have used our Rochester Hills party bus service for a wide range of celebrations. We are talking about birthdays, anniversaries, bachelor parties, the list for you to know about just goes on and on. However, we don’t care that much about the reason for the party rather than making sure that everybody has an amazing time. So, if you do indeed live in the Rochester Hills area and are looking for a party bus, then give us a call at Rockstarz Limousine and Party Bus. The other option is to use our website to get in touch and someone from our company will be in touch with you at the earliest opportunity.